I made mine about 4" shorter. 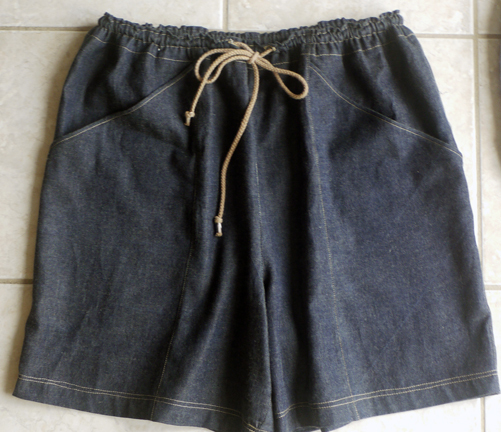 This pair was made with a cotton/tencel denim which was heavenly soft after washing. The pattern only calls for drawstrings, but I found that I needed elastic as well to keep them in place. 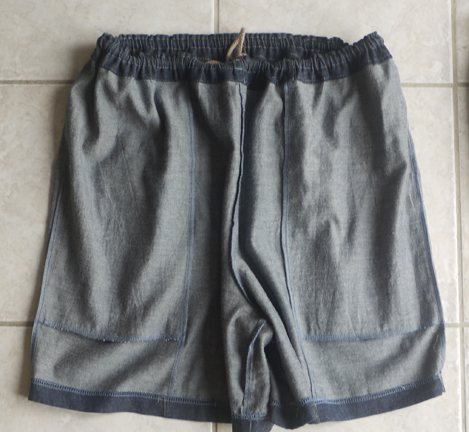 So, these shorts all have both 1/4" wide elastic and a drawstring at the waist. Here you can see just how deep the pockets are from the inside view- they are very generous- I could fit a small paperback book in them! 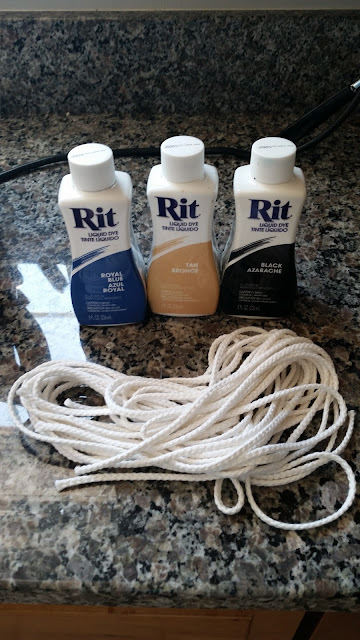 I wanted the drawstrings to be different colors, so I cut white cotton cording to the length that I wanted, and started playing with my Rit dyes. If you've never tried dyeing, you are in for a treat. It is so simple and much like dyeing Easter eggs. 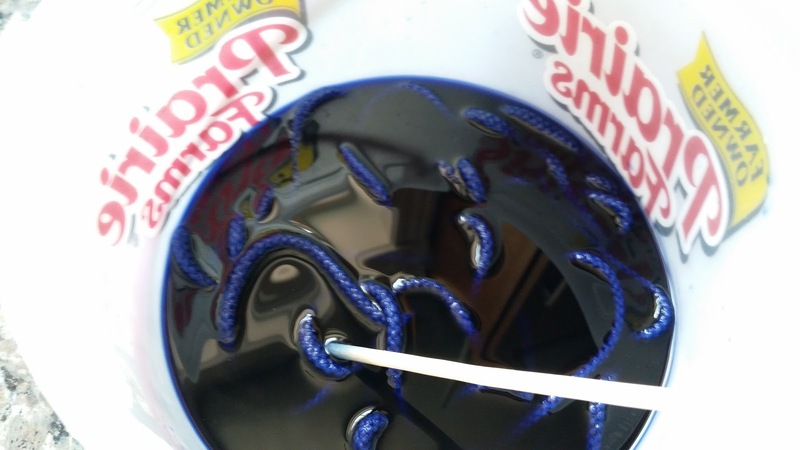 For something small like the drawstring, just put a splash of the dye in some very hot water in an old ice cream bucket, and stir it around for a few minutes. If you want the color to be lighter, take it out early. The longer you leave it, the darker it gets. Then, rinse, rinse, and rinse some more until no dye comes out in the water. I decided to do a bunch and be ready for future drawstring needs as well! 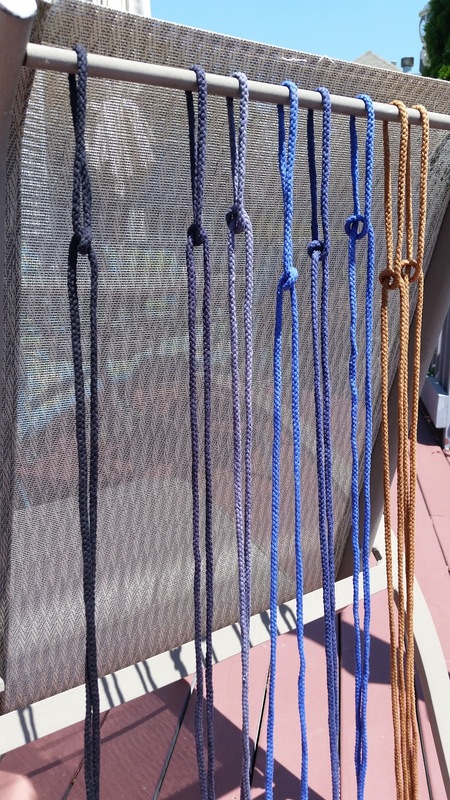 Here they are drying on my patio. 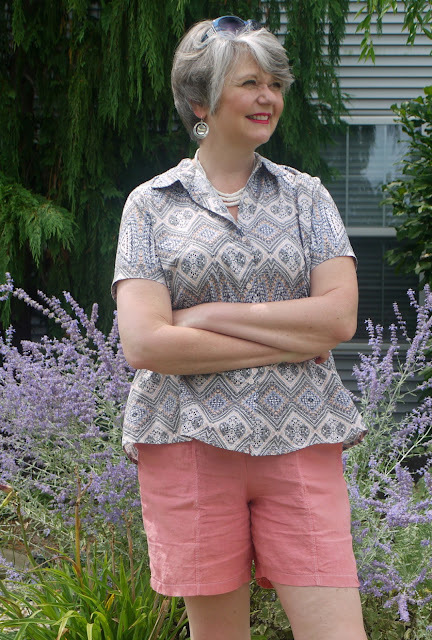 I also dyed a piece of pale peach linen into a deeper shade of coral, along with the drawstring, and that's what became my coral pink shorts. I knew that I wanted to make "camp" shirts, and for my first one, I used this poplin shirting print and Butterick 6070. I took extra care with this shirt to match the design, and flat felled all of the seams. It seemed to be fitting perfectly during the sewing process, but once I sewed the sleeves on, it was too snug. As soon as I raise my arms, it pulls across the bust. I think that the armholes are more suited to a sleeveless top, so I might cut off the sleeves and see if I like it better. The fabric is wonderful, so I hope that I can make it work. For my second shirt, I went looking for a more 80's style camp shirt with lots of room, and found this old Stretch and Sew pattern that had just the type of fit I was looking for. Interestingly enough, this pattern comes with a separate template for a sleeveless armhole, which is exactly the shape of the armhole on my first shirt, solidifying my belief that if I cut off the sleeves, it might work! 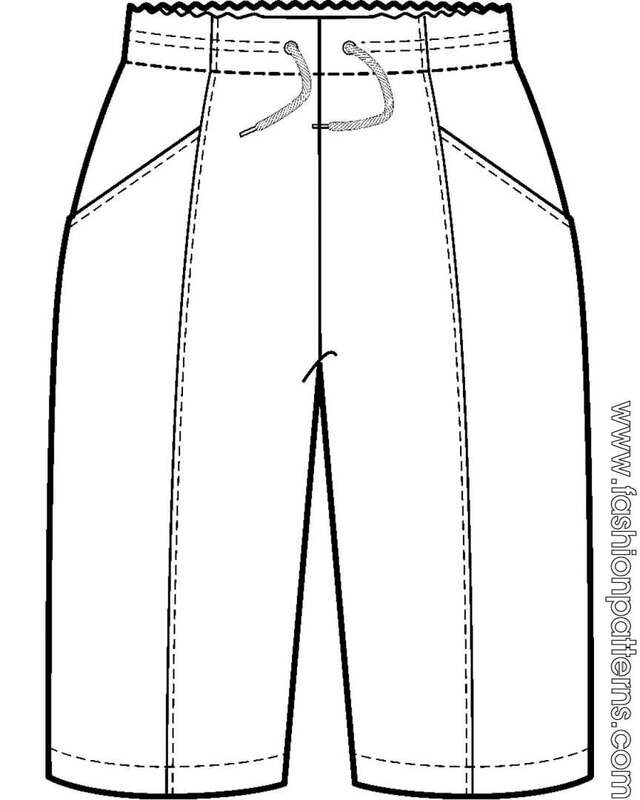 This pattern is for a dress, but I cut it at 26" long, instead of dress length to make it into a shirt. 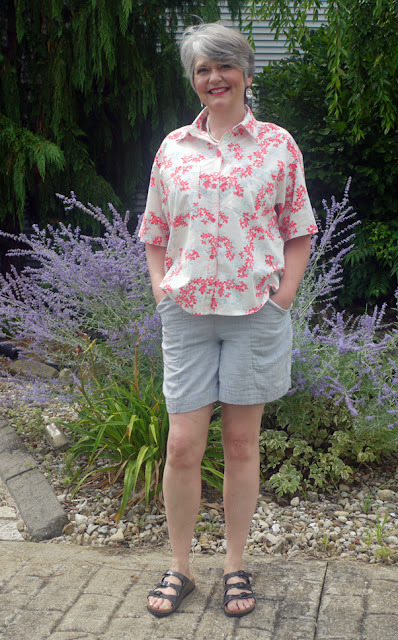 I used a beautiful cherry blossom cotton poplin for the shirt, and the shorts are from a double gauze. (Both are now sold out). I love this print, it is so pretty. The double gauze is a stripe on one side, and solid blue on the other. These shorts feature the striped side. This is my first time using double gauze, and it's very soft. Maybe too soft for shorts! It probably is better suited to shirting, but I will see how they hold up. 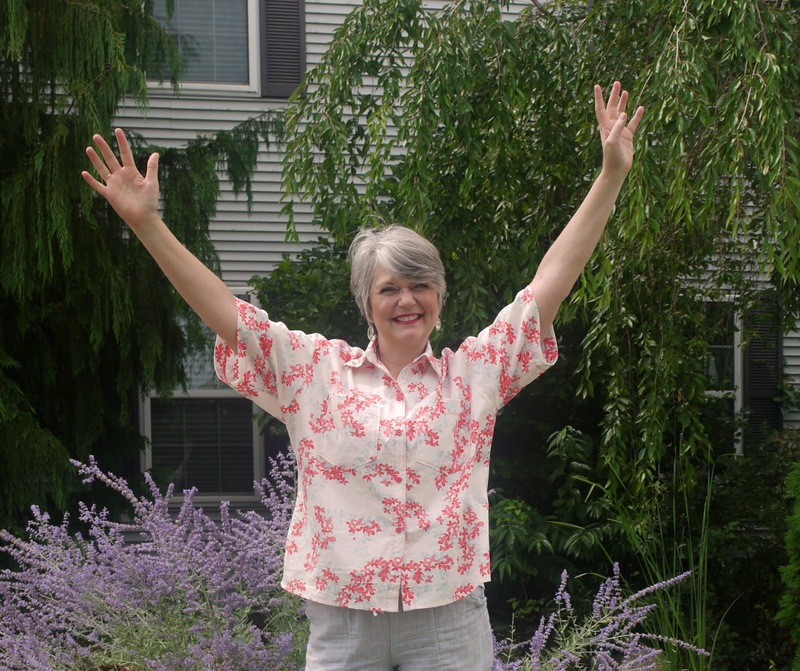 This shirt has a lot more ease, and I can raise my arms freely! I'm very happy with this one- it's just the epitomy of a camp shirt in my mind. For my last top, I went with a printed cotton gauze and Butterick 6455. This fabric is a single gauze and was surprisingly very easy to work with. Even though the arms are covered, the fabric is so lightweight that you don't feel too hot. I like the cinnamon color in this one- I think that it will transition into fall well, which is great because we still have lots of hot days all the way through September. So, I'm all set for this summer for my casual shorts and top needs! I love making all types of clothes, but there is something extra satisfying about sewing things that you know you can wear everyday. Do you agree? 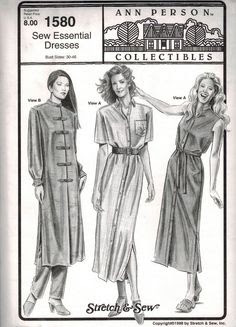 Thanks for the pattern recommendations- I will check those out! Good luck with your pants project! Was wondering if you purchased the cording online? 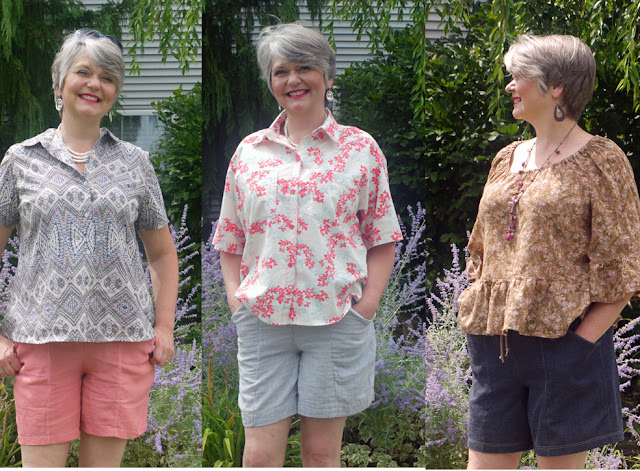 Mmm, armhole too small, that's the same problem I had when I made up that Connie Crawford blouse. Nice to know I was not the only one. Very nice camp shirt on the second go round. Yes, I read on Patternreview.com that other people also had some issues with this particular pattern. I noticed that the yoke on mine is way smaller than the illustration, so I thought perhaps they had left off the seam allowances. But I called Butterick and they said that no corrections had been issued. I have made loads of those CC shorts...love them! 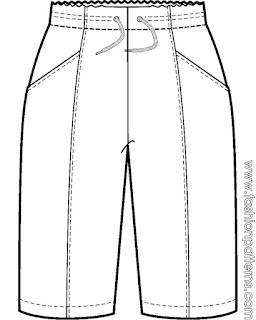 I lined the pockets with polyester to avoid bulk and just used elastic in the waistband. You look lovely in all those soft muted colors and soft fabrics. 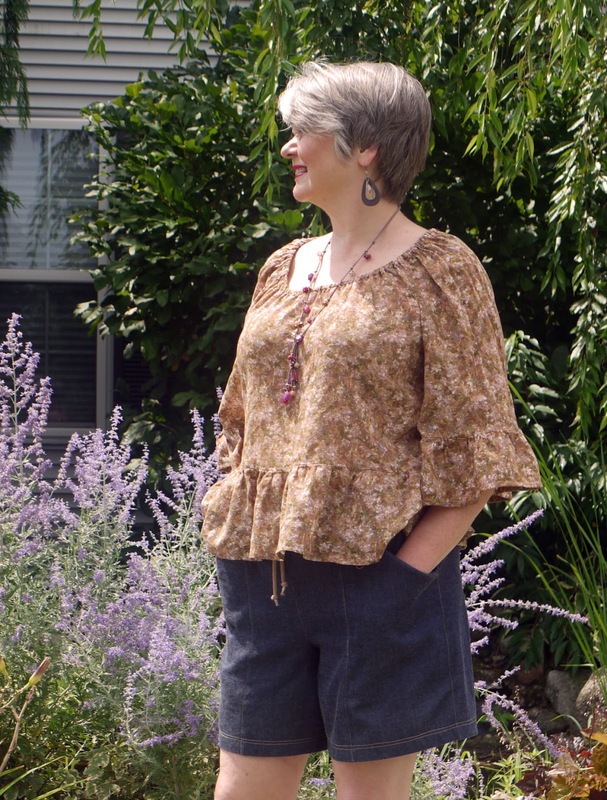 The brown blouse is especially well suited to your type being floaty and so feminine. THanks, Mrs. Mole. Good idea about the lining! That would make it quicker to dry too. Your shorts are fantastic! Great blog post. I love all of these coordinates and I really love making everyday basics like this because I get so.much.good.use out of them! Thanks for sharing Ann!